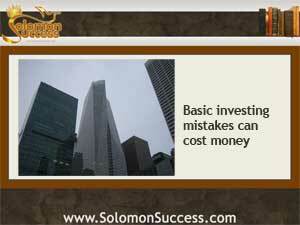 Solomon Success > Blog > Are You Still Making These Three Investing Mistakes? Are You Still Making These Three Investing Mistakes? It’s clear that King Solomon’s advice for successful and prosperous living hinges on the twin virtues of prudence and wisdom – and in a world filled with advice from all sides about the best ways to manage money and get rich from investments, they’re important watchwords for today’s money managers and investors. But even prudent investing plans can be derailed by a few basic mistakes. Topping Jason Hartman’s list of 10 Commandments for Investors is this: thou shalt educate thyself. It’s tempting to leap before you look on a good deal, or to put everything in the hands of a financial adviser, but investors who take the time to learn about the field and take charge of their investments are better able to spot problems, bad advice or shady deals. Taking the trouble to learn the language of investing, trusted sources for information and the history of firms you do business with can save money, enhance credibility and make future transactions run more smoothly. Taking the effort to thoroughly investigate the “next big thing” and to research financial advisers and their recommendations can prevent major pitfalls down the road. That extends to creating a plan for investing too – one that accounts for long term goals and short-term actions that lead to the outcome you want. Although it’s important to be in charge of your investing career – another of Jason Hartman’s 10 commandments – that doesn’t mean doing it all yourself. Part of the job of “doing your homework” is finding and creating a circle of advisers and supporting resources with the expertise and authority you need to make sound investing decisions. Becoming a knowledgeable investor is a key to weeding out the bad or fraudulent in a particular area, and to making sure that those advisers and support personnel are doing the right thing to implement your investing plans. Trying to do everything alone means not doing much at all. The smart investor gets informed, has a plan – and can identify areas where good advice and help might be needed. Investors are entrepreneurs entitled to the same considerations as any business – especially come tax time. But that means treating investing as real business, not a sideline or a hobby. Taking steps every day to implement an investing plan, maintaining a home office, keeping diligent records for tax deductions and staying on top of investing trends and events in a chosen market can go a long way toward building credibility and creating a foundation for the future. What’s more, establishing an identity as an investor opens doors to new opportunities and connections with investing professionals able to offer the best guidance and information.